Up for a drive to the Hamptons? Deep pocketed folks who live or visit there will have a chance to sample Swedish food fit for royalty tomorrow when the executive chef to the Royal Court of Sweden presents a tasting that will include the slow-cooked egg hors d’oeuvre served at Princess Madeleine’s recent wedding. “I have been cooking for the royal family for 17 years,” says Stefano Catenacci, also chef des cuisines at Operakällaren, a stately dining complex with four restaurants — one’s a nightclub — a cocktail bar, a wine cellar and event space in the shadow of the Stockholm Palace. On Saturday in East Hampton, Catenacci will present a Swedish tasting menu of five dishes during a benefit at LongHouse Reserve gallery and gardens. Included in the White Night tasting will be marinated salmon on a potato salad; a traditional Swedish cheese pie with vegetables and onion confit; a pickled beet salad with toasted pine nuts, goat cheese, horseradish and capers; and shrimp with pickled cucumbers. The previously mentioned egg appetizer will be served with an indulgent cream reduction, sourdough croutons, watercress and allerum, a sharp, semi-hard cow’s milk cheese from southern Sweden. The whole eggs take about an hour to cook to velvety softness. “It’s very important that it cooks at exactly 63 degrees, Catenacci says. Catenacci is one of 15 Swedish chefs brought to the Hamptons through Swedish Culinary Summer, the brainchild of investor Andrew Reice and his Swedish business partner Kent Jansen. They bring award-winning chefs to Hamptons-based summer charity events to introduce Swedish cuisine, and the drinks of sponsors such as Heering and Xanté, a pear cognac. Also in the Hamptons this weekend, Swedish chef Stefan Karlsson will be among participants in the Chefs & Champagne fundraiser for the James Beard House. “The high-profile and well-attended charity events every weekend provide the mechanism to project the best of Sweden to the best of the American market,” according to the Swedish Culinary Summer website, which lists events, dates and participating chefs. Tickets for the benefit featuring Catenacci’s tasting menu started at $750, but at last check, only tickets and table options ranging from $1,250 to $50,000 remained. Catenacci, who arrived in New York on Thursday, consulted with fellow Swedish chef Marcus Samuelsson on where to eat in Manhattan. The recommendations: The newish Thai restaurant Uncle Boons, the Italian place called Casa Lever, and the beloved Momofuko. And now back to Swedish Culinary Summer. The goal is to capitalize on the recent interest in Sweden and Swedish cuisine, showcasing the diversity. While Ikea may have given many Americans their first bites of Swedish delicacies, Reice and Jansen want the appreciation to extend beyond meatballs and lingonberry preserves. To that end, they also have staged media tastings to help publicize their events and increase public awareness of Swedish cuisine. 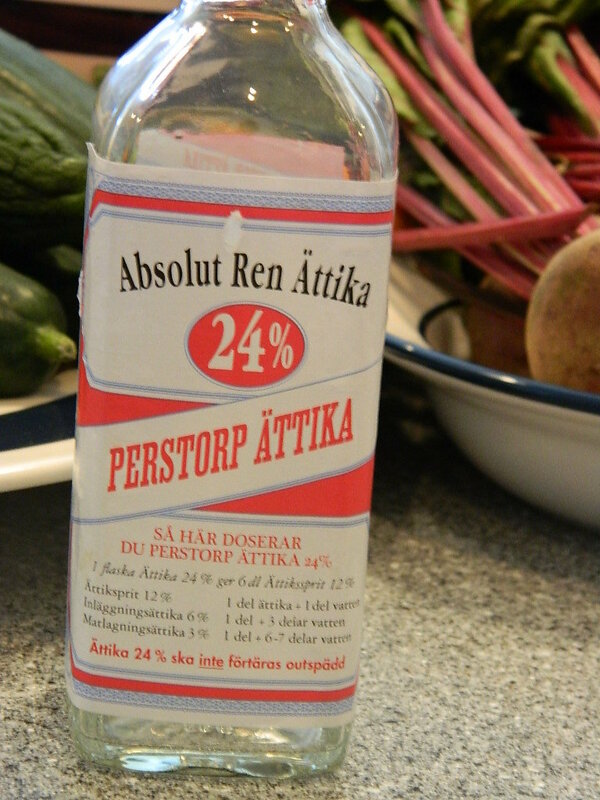 View full sizePerstorp Attika is a 24 percent acetic vinegar from Sweden. In various dilutions, it is used in Scandinavian recipes for pickling herring, cucumbers, beets, onions and more. Guests at a recent hands-on session were given an opportunity to pickle vegetables ranging from onions and cucumbers to carrots, grape tomatoes and beets and rhubarb. And those who fell for the potent Perstorp Attika (vinegar) were advised that it is nearly impossible to find in the U.S.
Magnus Lindström, named Swedish Chef of the year in 2003 demonstrated how a grilled steak with intense flavor begins with whole spices and fresh herbs. Cumin seed, fennel seed, fresh and dried rosemary, fresh dill and more were assembled on a work table giving guests an opportunity to grind their own fresh steak seasonings with a mortar and pestle. The blends were rubbed into both sides of the steaks, and grilled perfectly. Dill and horseradish, two important flavors in Swedish cuisine were offered with lemon zest, ginger and other seasonings to make sauces from crème fraiche, sour cream, or fresh mayonnaise. Xanté, a Swedish Culinary Summer sponsor, set up a cocktail mixing station where fresh lime slices were muddled to be mixed with the sweet pear cognac, fresh mint and simple syrup to shake into mojitos. Cocktails from Heering, a Danish brand also were offered during the event. Xanté CEO Adele Robberstad says the goal of the brands, both imported by Sazerac, is to create accessible cocktails with simple recipes that are easy to mix at home. For this reason, both company sites feature an array of recipes using no more than three or four ingredients. Meanwhile, Catenacci discusses the passion behind Operakällaren, dubbing it the most beautiful restaurant in Scandinavia. Named Opera Cellar for its original location in the cellar of the Royal Opera House, the historic 1895 building features intricately coffered ceilings, luxuriously carved oak paneling, and extensive gilding. The Opera Bar has a stained glass dome, Operakällaren even has its own champagne, calvados, whiskey and acquavit.